Mike Powell, Skate Guru from K2 Skates and Rob Gill, of InlineSkates.com, review the 2015 K2 VO2 100 X Pro Mens Inline Skates. So, we're talking about the VO2 100 X Pro from K2. Really cool skate. Moving into a much higher performance skate here. I'm going to pass it off to you and you can really hit on that first most important feature with this skate. Well, you know the most important feature is the K2 Original Soft Boot and it's a technology we developed when we launched inline skates. 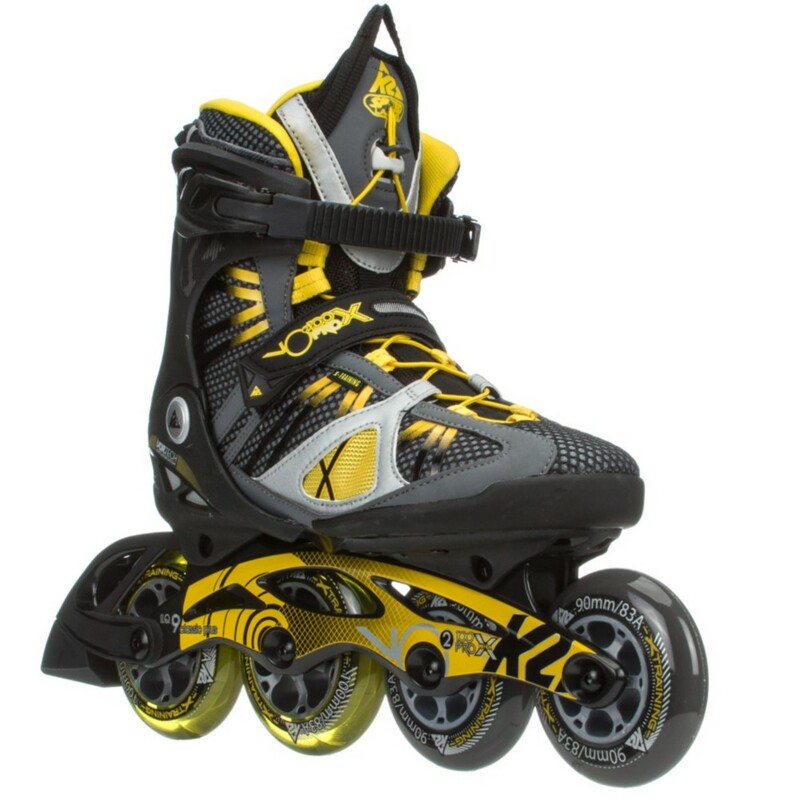 Every body else out there was building inline skates like ski boots so big pieces of plastic around your foot and we thought, there's a better way. That better way was building a soft boot which is pretty much a high performance piece of footwear that we developed an inline skate around. It really is. It's super comfortable. I absolutely love the fit of K2 skates. Let's talk a little bit about the cuff and closure system on this skate. Well, it starts with the VO2 cuff. That's gonna give you a whole lot of support so for a skate that's got a long frame like this, it's rare that you find a cuff that's going to give as much support as we do with the VO2 cuff. And then you move into the closure. You've got your buckle here and then your Speedlace System which is a pretty much a very easy system to use. You just give a tug on this Speedlace. That's going to tighten up the skate, you can shift on the fly while you're skating and tighten this thing up and it's a great system. For sure. I absolutely love the Speedlace system. So, easy to use. So now moving down the skate - aluminum frame and larger wheels, and not just larger wheels but kind of a unique wheel set up on this skate too. Yeah, so it's a Hi-Lo set up on this skate so you've got 100mm wheels on the back, 90mm wheels in the front. Kind of sits ya at a nice ramp ankle that's a great skating position, also gives you a lot of maneuverability which is key. I think you had mentioned earlier you had hockey skates like this. For sure, yeah, I have it on my hockey skates. It's obviously a much shorter wheel base but really same idea. Nice maneuverability but a higher top end speed. And then we tie this whole thing together with a Vortech Ventilation System. What that is is a channel, or 7 channels and grooves that run through the bottom of the skate. You've got air intakes up front, you've got exhausts in the back and pretty much when you're skating at speed, it's going to pull air through the skate, it's going to pull the moisture away from your foot and there's nothing worse than skating with a wet, soggy sock and we've eliminated that with our Vortech Ventilation System. For sure, and such an important feature on a skate like this because this skater is going to be skating longer distances for sure. Yeah, so and that being said, who is the skater for this skate? This is your more serious skater. Someone who wants the best of both worlds. The support of a fitness type cuff with the stability and speed of your training style frame and it's a serious skater who is out there, you know, a few times a week. They're using skating as a primary workout and they just love to skate. For sure. So, there you have it - the VO2 100 X Pro from K2. You can check it out on inlineskates.com and thanks for joining us on the Daily Spin.